Let us help you develop more collaborative working relationships amongst your team through our team building programs. 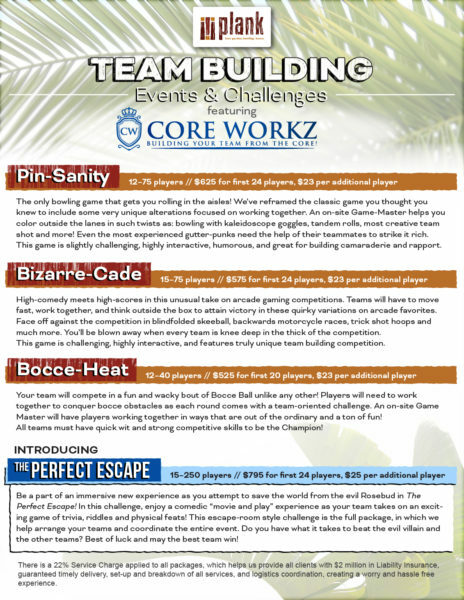 Whether you came to bowl, play bocce, or hit the arcade, we’ve got a team building package for you. For a detailed description of each program, please see below. Your team will compete in a fun and wacky challenge between Bocce Ball and Corn Hole. Players will need to work together to conquer bocce obstacles and with a fun corn hole twist. Teams must have quick wit and strong competitive skills to be the Champion! High-comedy meets high-scores in this fresh, twisted take on a game floor competition. Teams will have to move fast, work together and think outside the box to attain victory in these quirky variations on arcade favorites. Face off against the competition in hands-free air hockey, blindfolded racecar driving, human octopus dinosaur blasting plus more. You?ll wonder what we were “token” when we came up with this stuff. This game is moderately challenging and highly interactive, and features inter-team competitions. The only bowling game that gets you rolling in the aisles. We’ve reframed the classic game you thought you knew. An on-site game master helps you color outside the lane lines in such twists and tweaks as Loser Ball, non-dominant hand and even blindfolded. Even the most experienced gutter-punks need the help of their teammates to strike it rich. This game is lightly challenging, highly interactive, humorous and great for building camaraderie and rapport. Please Note: Team Building programs must be booked with a food & beverage selected from our event planning guide and are available Monday – Friday from 11am – 5pm only. To schedule your party, simply complete the online reservation form found at the ‘Request Information Today’ link below. © Copyright 2019 plank	. All Rights Reserved.